As the budget battles begin again with the arrival on Capitol Hill of President Obama’s fiscal proposal for the next year, there will be renewed focus on the issue of cutting the costs of entitlements. But as Washington debates competing deficit reduction plans, the public continues to say it is more important to keep Social Security and Medicare benefits as they are than to take steps to reduce the budget deficit. There has been little change in these opinions over the past two years. A survey in March found that 55% of Americans put the priority on keeping Social Security and Medicare benefits as they are over reducing the deficit. These majorities run across all age groups. 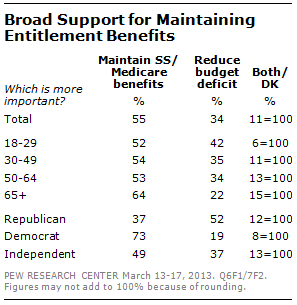 In comparison, about a third (34%) say taking steps to reduce the deficit is more important.